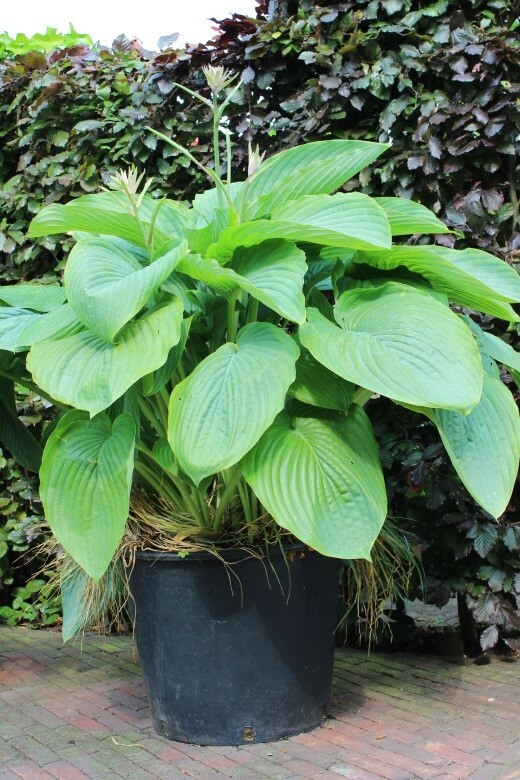 Hostas are one of the most popular perennials sold, all over the globe. These shade tolerant plants, with a wide variety of sizes, leaf shapes, colours and patterns are the passion of countless hobbyists, collectors, breeders, clubs and societies. Its common name is ‘plantain lily’. The word ‘plantain’ derives from the Latin word ‘planta’ which means: ‘sole of the foot’, a reference to its resemblance to the common plantain weed, Plantago major. The genus Hosta was named in 1812 by the Austrian botanist Leopold Trattinick after N.Th. Host, born in 1761. He was the personal physician of Emperor Frans the 1st of Austria and a great expert and author of the Austrian-Hungarian flora. Mr. Host died in 1834 in Schönbrunn near the Austrian Capital Vienna. Hosta sieboldiana ‘Empress Wu’ was bred by the American couple, Brian and Virginia Skaggs, Hosta lovers and hobby breeders ‘pur sang’. 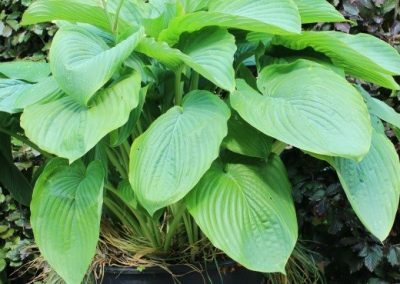 It is not fully clear of which Hosta ‘Empress Wu’ has its origin. It probably is a self- pollinating crossing of Hosta ‘Big John’ x Hosta ‘Big John’. 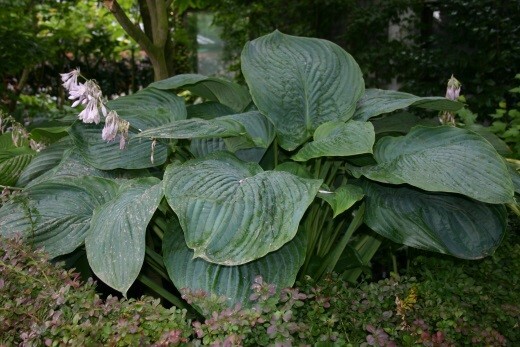 The ‘walking Hosta encyclopaedia’, Mr. Danny van Eechaute says to believe that Hosta ‘Empress Wu has the intricate background of the Hosta sieboldiana ‘Elegans’ hybrids. ‘Elegans’ is derived from the Latin word eligêre, which means: elegant, graceful, tastful. 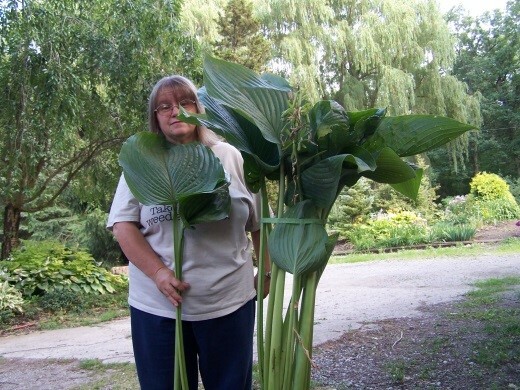 Hosta sieboldiana ‘Empress Wu’ is an unique plant and the biggest Hosta, ever developed. Unlike its parent, Hosta ‘Big John’, it blooms earlier and longer. The huge, dark green, deeply veined leaves form a massive clump. The flowers are pale violet. Hosta sieboldiana ‘Empress Wu’® was named after the Chinese Female Hero, Empress Wu Zetian(Tang dynasty 618-705 AD), the only female in Chinese history who ruled China as an emperor. She was a woman, doing a ‘man’s job’, acting no differently than most male emperors of her days. 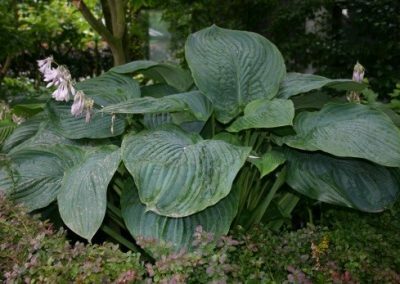 Hosta sieboldiana ‘Empress Wu’, is a Giant Hosta Monster and ‘a must have’ for every lover of large leave Hostas.